I was introduced to the Hunger Games probably about a week ago and I’ve already bought the second book and read it. Now I’m anxiously awaiting the 3rd book, which I have to wait to get until after I’m back from my trip. Gah, torture. These comics aren’t all that serious, I really love the Hunger Games and Peeta and Gale. Mostly Peeta. But my sister Betty thinks Peeta is a weenie and so that first comic came to fruition. I think everyone can recall the part of Catching Fire the second comic is referring to… I don’t know the exact details but this comic represents what I basically remember happening. 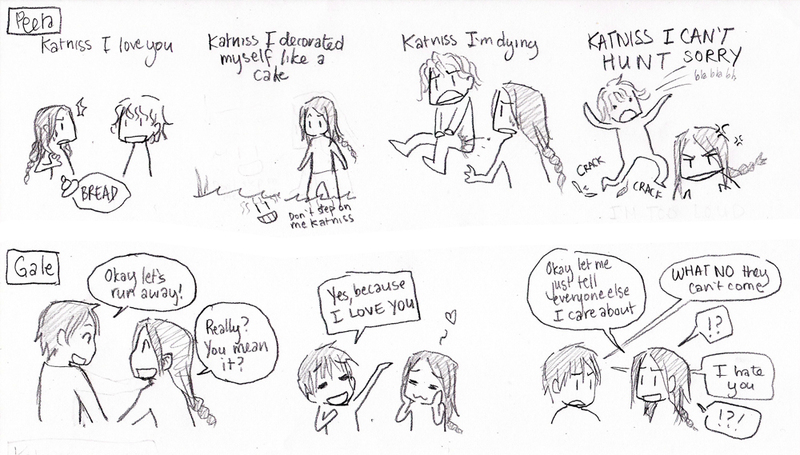 You still like Peeta even after making this comic? Oh wait, you like Jack Spicer. HAHAHAHAHA!! I love this!! But I still am in love with Peeta. But of all the comics I’ve seen, this is TOTALLY #1!! the best cmic i’ve seen so far, keep it up!!!! Ha I luv that it’s so true! I luv Gale though!!!!! Both hunger games boys that are interested in Katniss are terrible people. If Katniss didn’t save his bacon all the time, Peeta would be dead by now. But if Gale really cares about Katniss, he should volunteer with her and help her out. Also, SPOILER ALERT Katniss goes crazy (I mean, she’s been thrown into a giant battle royale two times in a row) so why anyone chases after her is beyond my understanding.